I have been on a real bloody mary kick recently, it seems to be the beverage of choice on football Sunday around our house. The only thing I really look for in a store bought mix is the right ingredient label (as per usual). I want the mix to be made from ingredients I can pronounce and buy in a grocery store- and so many mixes are full of preservatives and nastiness. Anyway, all that to say we were invited to a bloody mary making competition this upcoming Sunday for the Seahawks game so I am trying my hand at making a bloody mary! 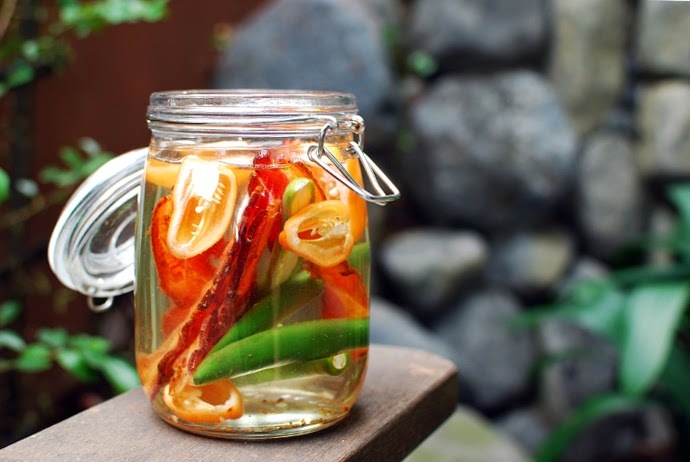 I started by finding a bacon habanero infused vodka recipe. That's right, I am bringing my A game to this friendly competition. I whipped up a batch last night, despite the recipe claiming that it needs to sit for 7 days... I have about 2.5 so that will have to do, haha. Also, it better taste delicious because the infusing jar looks really gross right now. Bacon debris/grease floating about with peppers and pepper seeds. It's pretty murky in there, folks. I wont show you what it looks like, but just consider yourself warned if you try to make your own batch. Update: The vodka turned out excellent! Straining twice with cheesecloth was a must. The only thing I would change about the recipe is how long it says to let the mixture nfuse. I had my jar sitting around for about 2 and a half days but by the time I tasted it Sunday morning, it was the spiciest vodka ever, like not of this world spicy. Why in the world would you let it infuse for a whopping 7 days?! That's madness. I might try letting it sit just one day next time, and nix the bacon. The bacon did add a hint of a smoky flavor to the vodka, but it was lost in the bloody mary. I say just infuse with the peppers.